A Prairie education is a long-term investment. When you consider the wide-ranging impact it will have on your child’s life, choosing this school could be one of the most important decisions you will ever make. The cost of private education represents a significant commitment for families. We strive to assist as many families as possible who cannot afford full tuition, but who are determined to stretch their own financial resources to make a Prairie education a top priority for their children. The school typically awards over $2 million of financial aid annually to more than one-third of the student body. Since many factors guide financial aid decisions, we encourage families not to make assumptions about whether they are eligible, but to have a confidential discussion with our Admission and Financial Aid staff. Through financial aid and payment plans, we strive to make Prairie affordable for all families whose children have been admitted. Upon acceptance of the contract, parent(s) or guardian(s) are responsible for the full tuition indicated on the contract, per the terms of the contract. Schedule a Tour If you are interested in learning more, we invite you and your family to campus for a personalized tour to experience the Prairie School. This annual fee is paid in nine monthly installments unless the family elects to pay the below amount in full. Included in fee: The annual Inclusive Student Fee includes textbooks, field trips, classroom consumables, art fees, iPads, iPad insurance, apps and other educational content for iPads, Primary School snacks, gr. 5-12 class trips/camps (Manito-wish, Washington D.C., Cincinnati/Indianapolis/Springfield/Hannibal, Timberlee), PSAT exam, graduation, gr. 5-12 athletic uniforms and fees, gr. 7-12 yearbook, gr. 5-12 math/science/ROV/foreign language competitions, gr. 7-12 Performing Arts scripts, scores, and dress/tuxedo. Much like colleges and universities, these costs are billed separately, primarily for accounting purposes and because fees vary by grade. Prairie offers a monthly payment plan through FACTS Management Inc. Details regarding this payment option may be obtained from Prairie’s Admissions office. Prairie also offers a semester payment plan through FACTS Management Inc. Details regarding this payment option may be obtained from Prairie’s Admission office. Semester payments are due July 15 and January 1. FACTS manages all bill payment transactions online. 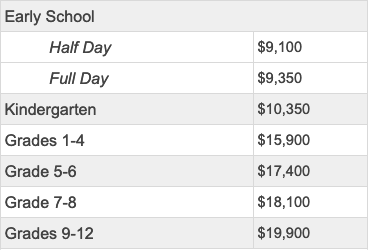 This includes billing for tuition, the lunch program, field trip fees, ticketing for events, yearbooks and more. The online tool allows families to view and pay bills through a secure account. All Prairie families (new and current) will be required to enroll in this system. Families are still given the option to mail payments directly to the Business Office. To access and create a FACTS account, click the icon below. Please contact Tara Nelson (262-752-2507) in the Business Office with questions. Need-based assistance (grants) are available to those students in grades 1-12 who are accepted to Prairie and demonstrate financial need. A family’s need is dependent upon many factors, including overall family income, comparing asset/debt ratio, number of children, any extenuating circumstances that the family is experiencing, etc. 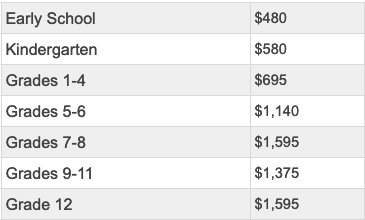 The majority of Prairie’s financial assistance is offered to students in grades 6-12, and the typical award ranges from $5,000-$6,000 per child. Given that financial circumstances may vary from year-to-year, all families must reapply for tuition assistance annually. Each family may assume that a student’s financial aid award will remain consistent, if the family’s financial situation has not significantly changed. Prairie School’s Financial Aid Committee holds, in strictest confidence, all financial aid information submitted to the School. If interested in applying for need-based assistance, please contact the Admission Office at 262.752.2525. Any student applying for financial assistance must be currently enrolled or an application for admission must be on file with the Admission Office. To ensure that the awarding of financial assistance is determined in an equitable manner, Prairie School uses the services of School and Student Service for Financial Aid (SSS), through the National Association of Independent Schools (NAIS). Families must complete the Parents’ Financial Statement (PFS), which can be accessed via sss.nais.org or can be mailed to you directly from The Prairie School. Prairie’s school code is 5896. These forms are available in January. Prairie School also offers families the opportunity to complete the Preliminary Financial Aid Form, prior to completing the admission process, to determine if a Prairie education is a feasible option. To receive more information on Prairie’s financial aid program, or to obtain the Preliminary Financial Aid Form, please contact the Admission Office at 262.752.2525. Prairie School is the first school in Wisconsin to receive this endowment and one of 48 schools nationwide to be selected by The Malone Family Foundation. Financial support for each Malone Scholar may range from 30% of tuition to a full scholarship. These scholarships are awarded to students entering grades 7-10 and are renewable through graduation.